The USB port is the most important standard PC connector on the planet these days. A USB port (see this figure) allows you to connect all sorts of peripherals, and USB ports are even becoming popular for connecting keyboards and mice. Intel is responsible for this most versatile of ports. It’s plug and play. You don’t even need to reboot your PC after you connect a USB device because Windows automatically recognizes the connection, and you can start using your USB peripheral immediately. One port supports dozens of devices. 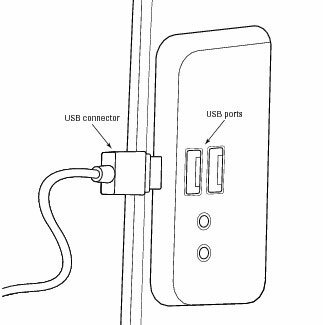 A single USB port can support up to 127 different devices, connected either in a daisy-chain configuration or by using a USB hub. It’s relatively fast. USB devices come in two flavors. The older USB 1.1 standard (which still delivers data transfer speeds that are many times that of a traditional serial port) has all but disappeared.